Winter greeted us early two falls ago in what I like to call “Flinter” – a mash-up of Fall and Winter together. Snow began in October and never ceased until April. And to top it off? This was the second year it happened. My son had just graduated from college and worked at Barnes and Noble while looking for a full-time job. Since he wanted to buy presents and save money, he told his dad and me to shop around the store and make a list for him. He could use his discount to buy presents. 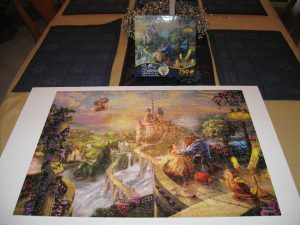 When I found the puzzle section, the Thomas Kinkade Beauty and the Beast puzzle called to me. I always liked puzzles as a kid, and it might be a long winter again. It might be just the thing to distract me. I put it, and only it, on my list. “Well, I’m around books all the time so I wanted something different. It will be a great distraction when I need a break from writing,” I answered. On Christmas Day, I got my puzzle and other gifts. I planned to start working on it in January and had the perfect place. The much-underused dining room. As the snow continued to fall, I smiled as I knew I had a distraction. I opened the box and let the 750 pieces fall to the table. Where to start? I hadn’t done a puzzle in years. I panicked as I looked at those cardboard shapes staring up at me, laughing and challenging me to try to solve the puzzle. I am an organized person, so the first thing I did was turn them all over to the correct side and study them. Nothing made sense. Nothing looked like the picture. Then it came to me. Start with the outline, the outer edge. So, I searched for all the flat-sided pieces and grouped them together. By the time my husband and son came home from work, I couldn’t wait to show them my progress. “That doesn’t go there,” my son said. “And the shape isn’t an even rectangle,” my husband replied. At that moment, I knew I would never complete this on my own. It would be sitting on my dining room table twenty years from now. Then I noticed my son fixing the outer edge, and my husband hunting for pieces. We didn’t say it aloud, but it became a family effort to finish the puzzle. I went to a craft store and bought a large foam board to work on. We sorted the pieces by color and recognizable shapes like trees, clothes or faces. The work continued for the month of January. One person would wander into the dining room and look for a few pieces, another would join them. That’s when I realized choosing a gift of a puzzle was much more than that. It created another memory before my son leaves home for that very last time. The joking and the high fives when we completed a section will never be forgotten. 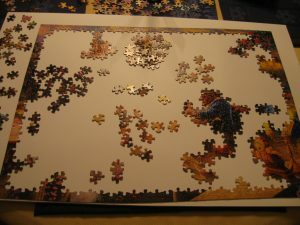 I recommend giving a large puzzle a try, with family or friends or neighbors or whoever you’re close to. You forget about texts and messages, the tweets of the world and pictures people are posting. It’s as if you’re immersed in another world, a throwback one, when people had to communicate with each other and work together. So, on this day, January 29, National Puzzle Day, remember these words. “Mom, I’m home! And guess what? 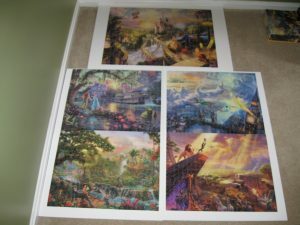 It’s National Puzzle Day, and they were all 20 per cent off at the store.” His hand reaches inside a bag and pulls out not one, but a box containing four Thomas Kinkade Disney puzzles.